Looking for unique giveaway items that are both stylish and affordable? Check out these promotional Silicone Wine Bottle Carriers! These light weight silicone bottle huggers expand and stretch around a bottle making it easy and stylish to carry into any event. Aside from that, they also hold up to 750ml bottles! Made from high quality silicone, these CAT are surely going to last. Transform these bottle huggers into powerful marketing tools by having your own logo or text printed on their special imprint area. 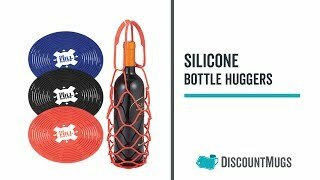 Our online design lab here at Discountmugs.com will make sure your silicone bottle huggers come out looking perfect! Order these promotional Silicone Wine Bottle Carriers from us today and enjoy our 110% lowest prices guarantee!